Here is a small selection of articles about or referring to the catastrophic blowout of the BP Deepwater Horizon exploratory oil well in the Gulf of Mexico, April 2010. This is Shell’s dream. The Canadian government just gave it permission to drill for oil off Nova Scotia’s coast — and the company doesn’t need to cap an oil blowout for 21 days. Are they kidding? Shell will be allowed to freely spill oil into the ocean for three weeks — potentially wreaking environmental havoc on Nova Scotia’s amazing marine life, major fishing grounds, coastal communities and the Sable Island National Park Reserve, the world’s largest breeding colony of grey seals. The U.S. requires oil companies to cap blowouts within 24 hours. Canada is giving Shell three weeks to bring equipment in from Norway after a blowout happens — 5,000 kilometres away. Shell is gambling with our oceans to cut its own costs. But we have a chance to stop it. The Canada-Nova Scotia Offshore Petroleum Board (CNSOPB) still has to make its final decision on Shell’s application. If we overwhelm it with objections, we can stop Shell. Tell the Petroleum Board to refuse Shell’s application to drill in Nova Scotia. Shell wants to drill up to seven exploratory wells — which are especially risky and prone to large spills — off the coast of Nova Scotia in the next four years. If a blowout did happen, it would be catastrophic for Nova Scotia’s major fishing grounds. Haddock, lobster and crab stocks would be at risk, as would whales, dolphins, sharks, sea turtles and hundreds of species of migratory birds. BP’s DeepWater Horizon disaster taught us just how devastating a prolonged blowout can be for wildlife, habitat and livelihoods. But some believe a blowout in Nova Scotia could be even worse — because the oil wells would be in much deeper water and a much harsher environment, and because of a lack of technological capability on Shell’s part. The SumOfUs community has stood up to Big Oil’s destruction of the environment, and we’ve had a major impact. Hundreds of thousands of us came together to stop Shell from drilling in the Arctic, and to demand that Chevron pay for its crimes in the Amazon. Now, let’s stand together to keep Shell out of Nova Scotia. Nova Scotia Petroleum Board: refuse Shell’s application to drill in Nova Scotia! A Nova Scotia environmentalist is criticizing federal Environment Minister Leona Aglukkaq’s decision to approve an “almost inconceivable” offshore drilling plan from Shell that allows up to 21 days to contain a subsea blowout, despite the U.S. requiring the same company to cap blowouts within 24 hours. On June 15, Aglukkaq signed off on the Canadian Environmental Assessment Agency’s assessment of Shell Canada’s Shelburne Basin Venture Exploration Drilling Project. Shell Canada’s spill containment plan, accepted by the agency, says it can have a primary capping stack in place within 12 to 21 days after a blowout off southern Nova Scotia. The Canada-Nova Scotia Offshore Petroleum Board has not given Shell approval to do exploratory drilling yet. 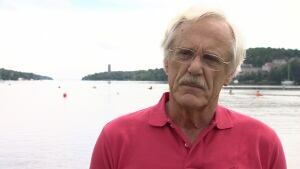 John Davis, a long-time environmentalist who spends a lot of time on Nova Scotia’s South Shore, said Shell’s plan doesn’t make sense. “It seems to me almost inconceivable that [Shell] would give themselves up to 21 days to stop a blowout in an area that is so close to all of our major fishing ground here on the South Shore,” he told CBC’sInformation Morning. In the environmental assessment for the project, Shell Canada said the capping stack equipment would be brought in from Stavanger, Norway. Shell said it would also deploy a backup capping stack from either Scotland, South Africa, Singapore or Brazil. Davis said the decision to allow Shell up to 21 days to cap a blowout in the Shelburne Basin is in stark contrast to what U.S. regulators are requiring from Shell for an exploratory drilling project in the Chukchi Sea in Alaska. The U.S. Interior Department’s Bureau of Safety and Environmental Enforcement has given Shell an exploration permit on the condition that it must have a capping stack on a vessel nearby on standby that must be deployed within 24 hours of a blowout. “What Shell said to our regulator is, ‘There isn’t a capping stack available in Canada, nor in North America. Nor is there a vessel capable of moving and maintaining that capping stack, so we can’t have one here because there isn’t one,'” said Davis. “The reality is, there is no capping stack and there is no vessel anywhere unless the oil companies are forced to have it near their drill site by the regulators. “The vessel carrying the capping stack to the drill site [off Alaska] came from Norway. It simply doesn’t make sense that you could accept that argument,” Davis said. CBC News has requested interviews with Environment Canada and the Canadian Environmental Assessment Agency to explain Aglukkaq’s reasoning for approving Shell Canada’s well containment plan for Shelburne Basin. They deferred questions to the Canada-Nova Scotia Offshore Petroleum Board. The board wasn’t available for comment Wednesday, but said it will speak to the issue later in the week. MONTREAL — Quebec must impose a 12-year moratorium on oil and gas exploration in the Gulf of St. Lawrence to give time for a comprehensive assessment on possible risks to the ecosystem, the chiefs of three native groups said Wednesday. The waters of the St. Lawrence are vital to the livelihoods of the Innu, Mi’kmaq and Maliseet nations and should be protected, they told a news conference in Montreal as the Assembly of First Nations continued its annual meeting. They also asked federal party leaders to tell voters ahead of this fall’s election where they stand on the protection of the Gulf from development. Mi’kmaq Chief Scott Martin said he feared an environmental catastrophe in the St. Lawrence similar to the 2010 Deepwater Horizon oil spill in the Gulf of Mexico that devastated parts of the southern U.S. coastline. Martin added there are currently “numerous knowledge gaps” within oil-industry reports on risks associated with drilling along the waterway. Martin said he wants an “integrated assessment” of all the risks involved with resource exploitation in the area before Quebec grants exploration or drilling permits. The chiefs said they decided the moratorium should last 12 years after calculating the time they thought it would take to conduct studies, write reports and consult the public. Resource exploitation along the St. Lawrence River cannot be carried out without their consent, the chiefs said, adding the Supreme Court of Canada ruled native people must be consulted and accommodated before their territory can be used for commercial development. Some chiefs were more hard line than others. Innu Chief Jean-Charles Pietacho said his people won’t be silenced with petrodollars. “Never will I accept royalties that come from (the oil and gas sector),” he said. Anne Archambault, grand chief of the Viger Maliseet First Nation, was more nuanced in her comments, saying she needed to consult her people before deciding on royalties. She said her people’s ancestral rights to the Atlantic salmon “take precedence over oil,” adding 95 per cent of her community’s revenue comes from the salmon industry. Chiefs from the Innu, Maliseet and Mi’gmaq Nations are demanding that federal party leaders tell voters whether they will protect the Gulf of St. Lawrence’s unique and vital ecosystem. The release notes that last month, Québec announced it would lift a moratorium on oil and gas exploration in the Gulf and begin granting permits once legislation is in place. Newfoundland has already granted an exploration permit at the Old Harry Prospect, northeast of the Magdelen Islands, but drilling has not yet been allowed. It says both Québec and Newfoundland’s powers are from the federal government and they will need federal government approval for major decisions. Old Harry is at the boundary used by Canada to assign each province its regulatory authority. A strategic environmental assessment by Québec concluded that a catastrophe on the scale of Deepwater Horizon is “plausible” if exploration goes ahead. The native groups stress in their news release that results would be devastating for a commercial fishery around the Gulf worth $1.5 billion annually and a tourism industry that generates another $800 million per year. The Innu, Maliseet and Mi’gmaq communities of Québec formed an alliance in 2013 for the protection of the Gulf of St. Lawrence. At the Assembly of First Nations meeting in Halifax in 2014, Maliseet and Mi’gmaq chiefs from Nova Scotia and New Brunswick joined them in calling for a moratorium. The award winning documentary “The Great Invisible” premieres on “Independent Lens” on PBS and on Pivot, Participant Media’s television network, on the fifth anniversary of the BP Gulf of Mexico oil spill disaster, Monday, April 20, 2015. This will be a rare opportunity to learn about the potential risks of planned deep water drilling in our own Gulf of Saint Lawrence. “On April 20, 2010, communities throughout the Gulf Coast of the United States were devastated by the explosion of the Deepwater Horizon, a state-of-the-art, offshore oil rig operated by BP in the Gulf of Mexico. The blast killed 11 of 126 rig crewmembers and injured many more, setting off a fireball that was seen 35 miles away. After burning for two days, the Deepwater Horizon sank, causing the largest offshore oil spill in American history. The spill flowed unabated for almost three months, dumping hundreds of millions of gallons of oil into the Gulf of Mexico and the Atlantic ocean, shutting down the local fishing industry, polluting the fragile ecosystem, and raising serious questions about the safety of continued deep-water offshore drilling. Brown traveled to small towns and major cities across Alabama, Louisiana and Texas to explore the fallout of the environmental disaster. Years later, the Southern Americans still haunted by the Deepwater Horizon explosion provide first-hand accounts of their ongoing experience, long after the story has faded from the front page”.